This is part three of a five-part series on nutrition within the lifecycle. Read part one and part two. The toddler years are seen as both fun and tumultuous. These years are filled with so many developmental changes that even parents have a difficult time keeping up. Children in the toddler years – ages 1-3 years old – go from crawling to toddling; from toddling to steadier walking; from walking to running, and from running to being ready to ride tricycles. Just as their motor skills begin to sharpen, so does their speech. By 18-months-old, toddlers can speak between 10-15 words. However, by the time they reach 2 years old, their vocabulary has leaped to over 100 words; and by 3 years old, they’re able to speak three-word sentences. What helps play a major role in this extraordinary leap in development? Nutrition. As mentioned in part two of this series, infants, within the first year of life, gain three times their body weight and need roughly 98/cal per kg of weight, which equates to about 800 calories a day. In short, infants want and need to eat a lot to sustain their growth. Toddlers, on the other hand, have a growth rate much slower (only 1cm a month), and it’s because of this reduced growth rate that they won’t seem as hungry. For parents, it can be frustrating and confusing to go from having a voracious eating infant to the complete opposite – uninterested, picky eating toddler. Rest assured though, this is completely normal in the development process. With toddlers wanting less and less food, it can be hard for parents to determine whether they’re getting the nutrition they need to help them develop. Thankfully, there are many ways to do this. An internet search of “how to get a toddler to eat healthy” yielded over 21 million different results. Opinions and suggestions are endless and if the internet search revealed anything, it’s that every parent has this same struggle. What can be another struggle for parents is portion size. What can be easily overlooked is that toddlers don’t eat like adults. Simple to say, but something that many forget when feeding their toddlers. Large adult-sized portions are often given to toddlers with the expectation of eating it all. This can coincide with feelings of the child never wanting to eat or having frequent battles at the dinner table over food. In reality, toddlers need toddler-sized portions. A general rule of thumb for a toddler-sized portion is 1 tablespoon of food per year of life. This means a 2-year-old would receive 2 tablespoons of food (1). Though this seems incredibly low, it’s far better for them to ask for more food than to have received too large a portion from the start. Putting this thought into practice, it’s important to see that snacking can and is considered a meal for a toddler. This can be a hindrance or a helping depending on how you view it. For many parents, giving their children various snacks, nutritious ones at that, throughout the day can help them feel they’re giving their toddlers the necessary nutrients needed, especially when the toddler happily accepts them. While others give their children snacks throughout the day and grow frustrated when they don’t want to eat dinner. This again is simply because snacking is a “meal” to the toddler. They’re already full by the time you sit at the table, and they’re unwilling to eat anymore. This is also because children have the internal cues of knowing when they’re full. At this young age, they don’t need to be told the amount of food to eat, because they already have that naturally built in. 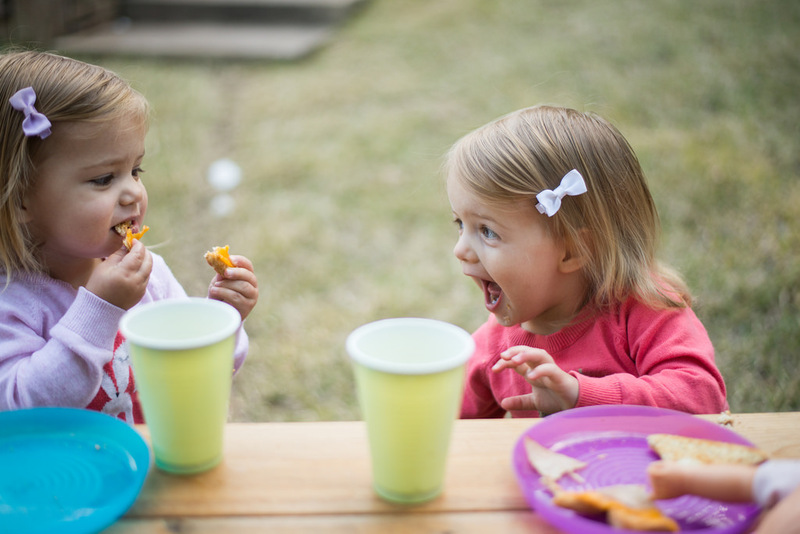 If you prefer having your toddler eat at the table with you, here are some helpful tips to make it as pleasant of an experience as possible. Hold off on snacks before dinner. By doing this, the toddler will be more likely to eat their dinner. Introduce a new food with a familiar food. To combat any pickiness, introduce the new food with a food your toddler loves. This, along with seeing you eating it, will peak their curiosity and want to taste it. Make dinner a fun, stress-free experience. If they refuse to eat, try not to show you’re stressed and aggravated over it (even though you may be on the inside). This can lead to fights and mealtime being the last thing anyone wants to do. Avoid bribes for “just one more bite.” This is counter-productive for everyone. Remember, the toddler already has an internal cue for when they’re hungry. Trust in that and avoid forcing more food on them than they need. This entry was posted in Cooking, Diet Tips, Fill Your Plate, Food, Grocery, Health Tips, Healthy Eating, Kids, Produce and tagged Eating, food, Growth, Health, Toddlers. Bookmark the permalink.